Quiggly's Clayhouse > Book your Birthday Party! Get in on the fun this year! Let us host an Art Adventure for your child's birthday. Reward your budding artist with a customized birthday party at Quiggly's. Choose the neatest pottery to paint, make the best mosaics, or sculpt the coolest creation with clay. 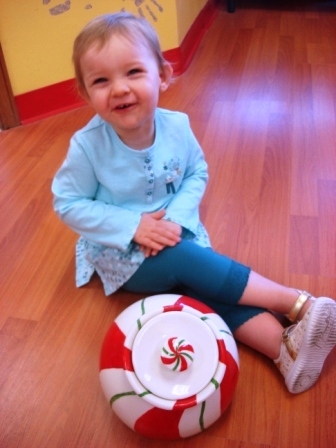 Your kids can even spin our pottery wheels! Get Clay'd up with us!! We offer a private party room that seats 16 - 25 with a separate area for food, drinks, presents etc. You activity may take place in this room. Your "fellowship" time after your activity will be in this room (Provided the room wasn't already reserved for another party). THERE WILL BE AN ADDITIONAL FEE FOR ANY PARTY/PRIVATE EVENT THAT IS SCHEDULED AFTER HOURS. $75 FOR THE FIRST 2 HOURS AND $25 FOR EACH ADDITIONAL HOUR. Pottery painting parties are a blast and last 1.5 hours (including time for cake and presents)! Your child and friends will enjoy their very own room at Quiggly's with a wing dedicated for cake and refreshments, gifts and friends. One of Quiggly's fun, friendly and dedicated staff-members will be your Party Artist in charge of helping the children throughout the entire process. Pottery painting parties range from $15/child to $20/child (plus tax). You can choose from anything in the studio, or pick from one of our party packages. 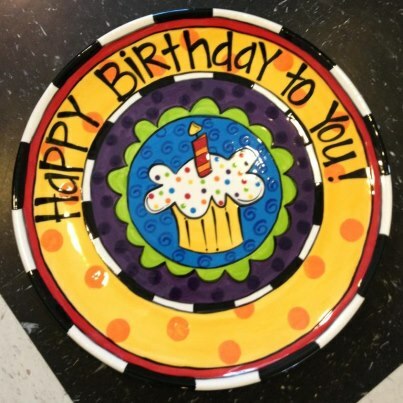 We have three standard pottery packages available for birthday parties of six or more painters. Children may choose from a number of pieces priced from $12 to $18. Only $35 reservation includes all supplies, paint, glazing and firing (this charge is NOT a deposit)! Min. 6 kids. Call today and ask about our "Anything Goes" party, where your children choose from practically anything in the store (items priced under $18)! Host a party with a sentimental twist! Quiggly's crew will help you make your youngsters' paws look super-cute on plates, mugs and hanging tiles! Gather your friends for a hand & footprint party and make keepsakes that will last a lifetime! Each child will paint the background color and decorations on their piece, and choose a handprint color! We'll make the print, sign the name and add some details! This is also a great opportunity to introduce your little ones to the basics of painting pottery! Only $35 reservation includes all supplies, paint, glazing and firing (this charge is NOT a deposit)! $15 each, min. 6 kids. Ever heard of a Pottery Wheel Birthday Party? Quiggly's Wacky Wheel Party is a success every time! For 1.5 hours (including time for cake and presents) your child and friends will learn to use our ten pottery wheels and actually create fun and functional vessels! Whether it be a mug, goblet, vase, bowl, tray or candlestick holder, all children will make a masterpiece on the pottery wheel. Their sense of ownership over their creations is truly magical! In between turns, kids have the freedom to sculpt anything they want! Kids love it! This party is perfect for ages 4 and up, and for as many as 25 children! Don't dress up for this one- we get a little dirty (but just a little)!! Only $22+tax. Only $35 reservation includes all supplies and firing (this charge is NOT a deposit)! Min. 6 kids. The actual wheel activity lasts about an hour (then 30 minutes for food and cake). Your "wheel time" includes a 15-20 minute introduction, then typically each child makes one piece on the wheel. We split the participants into two or three groups and we take turns for about 15 minutes each round (in other words, each child spins for 15 minutes). Children sculpt clay in between rounds on the wheel (sculpted projects are for fun only and will not be fired) Wheel pots are fired and ready for pick up around two weeks later. There is an additional charge if you return to glaze and re-fire the item. Quiggly's exclusive Clay Sculpting Party is another hit! We will sit at tables and teach your child and friends how to create practically anything for an hour, then spend 30 minutes for cake and presents. Many kids enjoy making piggy banks or beaded jewelry out of clay, while others enjoy making animals and fish. When you book your party, we will choose a project to fit your childï¿½s interests and skill level. Clay Sculpting parties cost only $18 per child +tax. Only $35 reservation includes all supplies and firings (this charge is NOT a deposit)! Min. 6 kids. Mosaic parties are fun too! Children create a cut-glass design onto tiles, plates or mugs. At home, the fun continues and the children grout their piece with parental help. Prices ranges $12-$18 per child depending on the inventory you use. Only $35 reservation includes all supplies and firings (this charge is NOT a deposit)! Min. 6 kids. Glass Fusing parties are available for children over 7yrs, and are $25/child. Projects include 4" tile coasters (or made into sun-catchers), as well as pendant and earring sets. Please call to learn more! Only $35 reservation includes all supplies and firings (this charge is NOT a deposit)! Min. 6 kids. If you want your party at your place, Quiggly's can make it happen! Pay only $150 for Quiggly's "Studio-to-Go" (does not include the party package price) and enjoy everything we have to offer in the convenience of your home! (If you live over 15 miles from Quiggly's, your charge will include a gas fee of $3.50/gallon). Minimum of 10 children for parties-to-go. (Wheel Parties to-Go are priced as "Wheels2You" Events. Schedule your child's party below! Please Call to Confirm your Booking (we endeavor to call you first). We cannot promise your party time-slot is available until we speak with you personally. YOUR PARTY IS NOT CONFIRMED UNTIL WE SPEAK WITH YOU. WE DO NOT CALL ON WEEKENDS OR MONDAYS.